On Thursday, the Supreme Court agreed to hear Janus vs. AFSCME, the case that will likely turn the entire public sector labor movement into a “right-to-work” zone. Like a lazy Hollywood remake, the case has all the big money behind it that last year’s Friedrichs v. CTA did, with none of the creativity. In Friedrichs, the plaintiffs argued that interactions between public sector unions and government employers are inherently political. Therefore, the argument went, mandatory agency fees to reimburse the union for the expenses of representation and bargaining were forced political speech, violating employees’ purported First Amendment right to not pay dues. The case ended in a 4-4 deadlock in March 2016, following the death of Justice Antonin Scalia, who had appeared poised to vote against the unions’ interests. Much like Friedrichs, the Janus case has rocketed through the federal courts. The National Right to Work Foundation, which represents the plaintiffs, petitioned the Supreme Court to hear the case in early June. All briefs will likely be submitted by mid-January 2018, meaning SCOTUS could hold hearings almost exactly a year to the date that the Court last heard the same arguments. The defendants may argue for procedural delays, which could potentially kick the decision into the following court term in 2018-2019. And it’s possible that in the meantime Justice Anthony Kennedy could die of a heart attack, or Sam Alito could forget to look both ways while crossing First St. and get run over by a bus. And the Democrats might take back the Senate next year, preventing the Trump administration from naming any more conservatives to the Court. That’s the kind of magical thinking we’re left with, because the conservative majority on the Supreme Court is clearly determined to tilt the power of the country in favor of big business and against unions for at least a generation, and they care little about how just or fair their decisions appear to the public. “Right to work” laws, currently on the books in 27 states, strip the requirement that union members pay union dues. Unions claim this creates a “free rider” problem, allowing workers to enjoy the benefits of union membership without contributing a dime. This deprives unions of crucial funding, but also—and this is no small consideration for the right-wing—every union family that drops their membership becomes one less door that union members can knock come election season. Most national unions have been preparing for this eventuality since the first time the Roberts court took up the issue of public sector union fees in 2014’s Harris Vs. Quinncase. (If you’re keeping score, yes, the conservative justices on the Supreme Court have spent three years in a row trying to break the backs of unions). There is a certain irony in conservatives applying the First Amendment to collective bargaining, a principle that conservative jurists have studiously avoided for two centuries. If every interaction that a union has with the government is a matter of speech, then we have a stronger argument for instituting a Bill of Rights for labor to protect workers and their right to demand fair treatment on the job. Unions are already oppressively regulated. They are told by the National Labor Relations Board whom they can picket, when they may march and what they might say on a flyer. And they face steep fines if they disobey. Workers are forced to attend endless hours of anti-union presentations before a union election with no right to respond or boycott. If every interaction the government has with a union is a matter of political speech—as a ruling in favor of Janus would imply—unions must respond by forcefully arguing that the rules of the system have been unfairly holding workers back, violating of our rights to free speech, due process and equal protection. This blog was originally published at In These Times on October 18, 2017. Reprinted with permission. About the Author: Shaun Richman is a former organizing director for the American Federation of Teachers. His Twitter handle is @Ess_Dog. In a badly needed victory for organized labor, a coalition of workers’ rights groups in Missouri is poised to halt a devastating new anti-union law from taking effect later this month. The deceptively named “right-to-work” (RTW) legislation—quickly passed and signed into law this February by Missouri’s new Republican governor, Eric Greitens—would prohibit unions in private sector workplaces from automatically collecting dues from the workers they are legally required to represent. Designed to decimate unions by cutting off their financial resources, RTW laws are currently in place in 27 other states. Though the law is set to take effect on August 28, the pro-union We Are Missouri coalition, led by the Missouri AFL-CIO, says it has collected enough signatures from voters to call for a state-wide referendum in November 2018 that could nullify the legislation. Implementation of the RTW law would be put on hold at least until next year’s referendum results are known. Missouri allows residents to call a referendum on new legislation by collecting signatures from at least 5 percent of voters from six of the state’s eight congressional districts. “When Gov. Greitens signed the so-called ‘right-to-work’ law, we had a petition ready to go,” Swinford explains. So far, the coalition has tripled its initial estimation, collecting over 300,000 signatures. During a rally at the state capitol today, We Are Missouri turned in the petition along with 310,567 signatures. The National Right to Work Foundation sued to block the initiative on the grounds that the petition contained bad grammar, but the Missouri Court of Appeals threw out the lawsuit last month. Now that it appears they will not be able to prevent a referendum from appearing on next year’s ballot, Missouri RTW advocates are gearing up for a showdown in November 2018. Over the past week, three anti-union political action committees in the state have received a total of $600,000 in dark money contributions. At least $100,000 of this money came from Gov. Greitens’s own nonprofit. Meanwhile, the Koch-funded Americans for Prosperity Foundation recently launched an expensive “education campaign”—including ads, door-to-door canvassing, and phone calls—to convince voters to approve the RTW law. Swinford says anti-union forces are also resorting to “old-school intimidation tactics.” Last week, four men circulating pro-RTW brochures were spotted carrying pistols outside the Buchanan County courthouse in St. Joseph. Missouri’s Republican lawmakers also recently passed legislation that will cut the St. Louis minimum wage from its current rate of $10 per hour to $7.70. The “right-to-work” law would also likely have a negative effect on worker pay, as wages are on average 3.2 percent lower in RTW states than those without RTW laws on the books. Anti-union forces are not resting on their laurels. Earlier this year, House Republicans introduced a national RTW law, and the Supreme Court could soon hear a case that threatens to impose RTW on the entire public sector. But anti-union legislation has been defeated before. In 2011, labor groups in Ohio called a referendum that successfully overturned the controversial Senate Bill 5, which would have severely curtailed public sector workers’ collective bargaining rights. “What happened in Ohio shows that it’s possible to really educate folks and show them there’s a way to stand up when your legislature overreaches,” Swinford says. This article was originally published at In These Times on August 18, 2017. Reprinted with permission. About the Author: Jeff Schuhrke is a Working In These Times contributor based in Chicago. He has a Master’s in Labor Studies from UMass Amherst and is currently pursuing a Ph.D. in labor history at the University of Illinois at Chicago. Follow him on Twitter: @JeffSchuhrke. Union supporters had reason to cheer earlier this month when Wisconsin Gov. Scott Walker’s hated “right to work” law was overturned by a Dane County Circuit Judge. Unfortunately, the decision is all but certain to be overturned by Wisconsin’s conservative Supreme Court. But contained in the case is a line of questioning over the constitutionality of the right-to-work concept that has quietly been playing out in federal courts. The result could be that all right-to-work laws are nullified—and sooner than you might imagine. The logic that the Wisconsin judge leaned upon in his decision has its origins in a federal case called Sweeney v. Pence, in which unions made an unsuccessful attempt to overturn Indiana’s recent right-to-work statute on constitutional grounds. Although the unions themselves did not raise this argument in the 2014 case, Chief Judge Diane Wood argued in her dissent that “right-to-work” provisions violate the U.S. Constitution’s Takings Clause. If the issue makes its way up to the Supreme Court, and the justices agree with Secunda, the result could overturn the section of the National Labor Relations Act that allows states to pass right-to-work measures as well as the statutes in all 26 states that have passed them in one fell swoop. The Wisconsin case won’t get there. Because Wisconsin is in the same 7th Circuit that rejected the “takings” argument in Sweeny v. Pence (making it, for now, a settled matter there), unions filed their case in state court over the state’s constitution. The “takings” approach is not without its critics. Seattle University Associate Professor of Law Charlotte Garden notes that Judge Wood’s interpretation of the Takings clause is one more commonly advanced by anti-regulatory conservatives, and that labor taking up the cause could have unintended consequences. “There’s a difficulty of applying existing ‘takings’ law in this kind of context,” she says. “Takings” is generally applied to property, she says, and what’s being taken from unions is the labor of their staff. As an alternative strategy, Garden points out that the NLRB has indicated an openness to considering whether unions in right-to-work states can charge a fee to non-members who want to file a grievance. Any rulemaking by the Board on right to work can expect to be challenged by business interests, which could open different constitutional questions about the law. The Indiana unions actually argued in Sweeney v. Pence that the Taft-Hartley amendments to the NLRA were only meant to apply to questions of compelled union membership, not fees for service. But I believe there remains a compelling argument about legislative intent. The judges who rejected the “takings” logic in Sweeney vs. Pence argued that unions weren’t uncompensated for their duty to represent all workers in a bargaining unit. They wrote, “we believe the union is justly compensated by federal law’s grant to the Union the right to bargain exclusively with the employer. The reason the Union must represent all employees is that the Union alone gets a seat at the negotiation table.” This is a bunch of ahistorical nonsense that betrays a lack of understanding of labor relations and power dynamics. But why should we expect a couple of judges to get this right when most union activists are so muddled on the history and effects of the duties of exclusive representation and the union shop? To win, we need to understand our history and have real clarity on our goals to regain power. When the National Labor Relations Act was written, unions were “members-only” organizations that competed with each other. They contested for power in the same workplaces over who would make the best bargaining demands, who could extract the bigger concessions from management and who could organize the most successful job actions. Employers hated this. In pursuit of labor peace, employers began signing contracts with unions as the “sole and exclusive representative” of their workers. These early contracts gave employers a one-year guarantee that there would be no new union demands and no strikes. Unions went with it because it helped knock out the competition. The NLRB, which had been certifying unions as representing their members only, also went with it and now certifies unions as exclusive representatives, exclusively. Agency fee originated not merely as compensation for the financial costs of representing all the workers in a unit, but for the political costs. During World War II, patriotically motivated unions pledged not to strike, and were rewarded with government-dictated wage freezes. Workers protested by quitting their unions. In order to keep unions from dropping their no-strike pledges, the War Labor Board began to reward unions a “maintenance of membership” rule which prevented workers from quitting the union during the term of a contract. This evolved into the union shop and agency fees. The combination of exclusive representation and agency fee does contain the potential for real power and real wins for unions, as well as labor peace for employers. But it also tends to make unions more conservative and less militant. Exclusive representation without agency fee is the worst of both worlds, and should be resisted. For three quarters of a century the only way that the NLRB would “certify” a union was as the exclusive representative of all of the workers at a represented workplace, mostly with the union’s understanding that it could bargain for a contract clause that obligates represented workers to pay some fair share of the union’s expenses. This “union certification” gives collective bargaining the force of law that an arm of the federal government—the NLRB—will drag an employer that refuses to recognize and bargain “in good faith” with a certified union to court to force them to. So, for a union to tear up this “certification” to represent all of the workers and say, “we only represent our members now” carries the risk of losing the backing of the NLRB—but the potential reward of forcing the courts to grapple with the tradeoffs of forced representation without taxation. To win big, we need a union in a right-to-work state that is genuinely willing to cede exclusive representation to kick out the scabs. What I think this would look like is that union, just prior to the expiration of their current contract, filing a letter with the employer and the labor board disclaiming representation of the entire bargaining unit but demanding to bargain for their members only (and subsequently refusing to bargain over a no strike clause). We’ve got a much stronger case if it’s brought to federal court by an employer complaining that a union won’t represent all the workers than one brought by a union complaining about a loss in agency fee revenue. The idea that the Supreme Court could swing from seriously considering forcing the entire public sector to go right to work in this term, to weighing the very constitutionality of right-to-work laws two or three years later might seem too fantastical, but such is the strange lack of case law over the underlying legal justification for requiring that a union represent all the workers but forbidding them to mandate dues and fees for that service work. As I’ve noted, unions have tended to shy away from judicial strategies, and, on right to work in particular, labor has long favored a legislative solution. Repealing the Taft-Hartley Act that contained the right-to-work amendment to our nation’s main labor law was the top legislative priority of the AFL, the CIO and its merged successor from the time of its passage in 1947 well into the 1980s. The AFL and the CIO, which by 1947 had both abandoned organizing the south, seemingly wrote the former Confederacy off at the time. Since labor lost little to no membership as a result of those first 12 right-to-work states, little brainpower was devoted to challenging the constitutionality of the scheme. Likewise, when right to work next spread to western and plains states like Arizona and Nebraska, labor similarly wrote them off. When right to work first spread to a bedrock labor stronghold, Indiana in 1959, the move was so controversial that within eight years labor had managed to overthrow the Republicans, who supported it in all three chambers of government and repeal the law. This win—the only instance of a right-to-work law being repealed legislatively—may have ultimately been counterproductive, giving unions false hope that killing right to work is a matter of making sure the bad guys don’t win re-election. The labor movement of 1965 could entertain such fantasies. The labor movement that has seen bases of union power in Indiana, Michigan, Wisconsin and West Virginia go “right to work” within the same half decade must wake up to the fact that it will take more than elections to reverse the damage. It will also take a judicial activism agenda for labor, like I have advocated. And ultimately, working people in America will gain no new rights without stoking a hell of a lot of chaos, through strikes and more. But we’ll also gain no new rights without legal demands like the Operating Engineers Local 370 v. Wasden case hanging out there. It is now up to the sisters and brothers in other “right to work” states—Michigan, West Virginia and beyond—to join the fight. This blog originally appeared at InTheseTimes.org on April 21, 2016. Reprinted with permission. 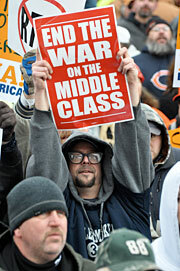 Without aggressive action, the right-to-work tsunami will sweep more states. “Just Cause for All” campaigns should be part of the strategy. Wisconsin is now the 25th state to adopt a so-called “right-to-work” law, which allows workers to benefit from collective bargaining without having to pay for it. It joins Michigan and Indiana, which both adopted right to work in 2012. Similar initiatives, or variants, are spreading to Illinois, Kentucky, Maine, Missouri, New Hampshire, New Mexico, and West Virginia—and the National Right to Work Committee and the American Legislative Exchange Council probably have a well-developed list of additional targets. Without aggressive action, the right-to-work tsunami will sweep more states. To defeat it, the first step is committing to fight back, rather than resigning ourselves to what some say is inevitable. That argument certainly works for most union households and many of our community allies. But the real challenge is to convince a much broader public that a strong (and fairly-funded) labor movement is in their interest and worth preserving. Clearly most Americans aren’t yet convinced. Many unions over the last few years have undertaken important campaigns along these lines. For example, teachers unions have positioned themselves as defenders of quality public education. Refinery workers have struck for public safety. Nurses and health care unions have fought for safe staffing to improve the quality of care. And most notably, the Service Employees (SEIU) and others have waged the “Fight for $15” for fast food and other low-wage workers. In its own way, each union is working hard to be a champion of the entire working class. Yet with the exception of SEIU’s Fight for $15, each is essentially focused on the issues of its core constituency at work. This still limits the public’s perception of labor. Supporters of right to work cynically play on the resentment many workers feel about their declining standard of living. Absent a union contract, the vast majority have few, if any, ways to address it. To most, organizing looks impossible and politics looks broken. Workers’ understandable frustration is fertile ground for the far right, which promises to improve the business climate and create more jobs by stripping union members of their power. Thus, when we anticipate right to work’s next targets, the best defense should be a good offense—one that clearly positions labor as a force for the good of all workers. Such a law would take aim at the “at-will” employment standard covering most non-union workers in the U.S. At-will employees can be fired for any reason and at any time—without just cause. While such a major expansion of workers’ rights as Just Cause for All would be unlikely to pass in most state legislatures—Montana did it in 1987, but it’s still the only one—it could become law in states that allow ballot initiatives. A well-orchestrated attack on the at-will employment standard would force the extreme, anti-worker, and big business interests who back right to work to respond. If nothing else, imagine how competing initiatives would force a debate. On one side, extending due process protections and increased job security to all workers: a real right-to-work bill. On the other side, taking away fair share contributions for collective bargaining. While it’s unfortunate that the labor initiative didn’t go before Colorado voters, the result was still encouraging—and instructive. By championing the interests of all workers, labor split business and blunted the right-to-work effort. To win back “fair-share” participation in the three new right-to-work states and stop further attacks, we’ll need well-planned campaigns that include grassroots mobilization, direct action, paid and earned media, and focused electoral work. 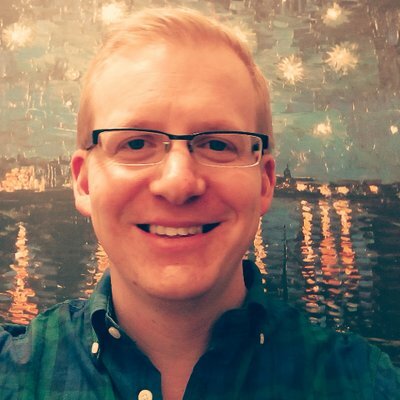 About the Authoer: Rand Wilson is policy and communications director at SEIU Local 888 in Boston. Michigan’s recent battle makes this a good time to explain the union movement’s important role in our economy’s overall health. We’re about to explain why today’s war on unions is bad for all of us, no matter what we do for a living, and we’ll do it in four steps. But first a word about language: “Right to work” is a misnomer for laws which let employees enjoy the benefits of union membership – at least for a little while, until they’re stripped away – without joining or contributing. So we’ll call them “right to shirk” laws instead. And we’ll call the people who back these laws Shirkers. And while we’re at it, let’s stop calling the states that have adopted this legislation “right to work.” They don’t give people any new rights. They take rights away, by making it illegal for employees to organize and negotiate together. They even take away employers‘ rights – to sign a certain kind of contract. Right to Shirk laws allow freeloaders to profit from the efforts of others – without contributing to the effort, and in a way that harms the common good. The billionaires and corporations behind these laws wouldn’t deliberately do anything like that, would they? Why, that would be like letting people make billions from the works of government – things like roads, the Internet and publicly-educated customers – without paying their fair share of taxes. 1. Think nationally, not just locally. Advocates say these laws create jobs. They don’t. Their “evidence” is based on studies which show modest job growth in Right to Shirk states when compared to free states. But all that proves is that places that are politically hostile to organized labor also offer other types of corporate favoritism. It also suggests that Right to Shirk states can steal jobs from free states — as long as the jobs last, anyway. The Shirker movement was started in the late 1940s by a handful of Southern politicians who were in the palm of big textile mills. They were able to draw textile jobs away from free Northern cities like my hometown of Utica, NY – until those jobs left this country altogether. That’s not “creating” jobs — that’s killing good jobs and replacing them with ones that don’t pay enough. The concept of “solidarity” has been tarred with McCarthyite smears. But “solidarity” is just another way of saying “We’re all in this together.” The Right to Shirk crowd wants to stop that kind of thinking so it can pit state against state and employee against employee, shredding our social fabric for personal gain. It’s no accident that the Shirker movement was started by the reactionary white politicians of the Jim Crow South. Back then they were still pining for the days when they could offer some folks the “right to work” … for nothing. 2. We’re fighting over a shrinking pie instead of making the pie bigger. Things are bad. We need millions of jobs – and the jobs we do have don’t pay enough. The graphic which Business Insider likes to call “the scariest chart ever” shows how far we are from creating the number of jobs needed to make this country’s economy grow and thrive again. 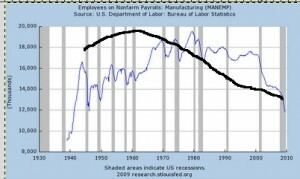 Job growth like that we’ve seen recently is always welcome, but it’s not nearly enough to get us out of this ditch. How do we get moving again? To answer that question we need to know what’s worked in the past. 3. The real “job creators” are people with jobs – good jobs. How did this nation finally escape the after-effects of the Great Depression and begin its greatest decades of economic growth? Government spending – on roads, bridges, schools, and other vitally needed services – played a key part. Unions were a crucial part of this process, too. By fighting for higher wages and better benefits, unions ensure that working people have the means to purchase consumer items, housing, and other goods and services. Companies have to hire more people to keep up with demand – and the good jobs keep coming. That’s why the Republican Party platform of 1956 boasted that “unions have grown in strength and responsibility, and have increased their membership by 2 millions” during Dwight D. Eisenhower’s first term. Back then Republicans understood that a growing middle class was good for the entire economy. That party platform also said that “America does not prosper unless all Americans prosper.” Their rule: No shirkers. But then in those days our economy wasn’t dominated by Wall Street megabanks – institutions that don’t build or sell anything. And politicians weren’t completely in bankers’ pockets back then, because the public wouldn’t have tolerated it. We shouldn’t tolerate it now. 4. When you kill unions, that reduces consumer income – which kills jobs. 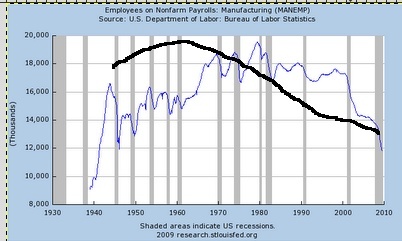 That’s my freehand drawing (and therefore not exact) of the trend line in union membership, superimposed by the number of manufacturing jobs in the United States. 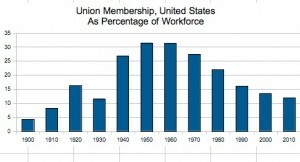 Manufacturing jobs kept on increasing for more than twenty years, even as union membership increased. These jobs experienced periods of decline and stagnation as union membership fell, even before the devastating impact of NAFTA. Consumer demand is vital to growth. That demand is tied to consumers’ income, and to their belief that life in the future will be as good or better than it is today. Those are the two things we need to reinforce, and unions are crucial to that effort. We need to get our economy growing again. Until then most Americans, unionized or not, will continue to struggle with stagnating wages and an ongoing economic drag that can feel a lot like a recession. As Paul Krugman likes to say (he said it in our radio interview), This isn’t rocket science. We know how to do this. Destroying unions is just another way for the Shirkers to make sure that we never do. This post was originally posted on Our Future on December 13, 2012. Reprinted with Permission. About the Author: Richard Eskow is a well-known blogger and writer, a former Wall Street executive, an experienced consultant, and a former musician. He has experience in health insurance and economics, occupational health, benefits, risk management, finance, and information technology. He has a somewhat unique perspective on the current financial crisis, since he worked for AIG for a number of years (although not in its infamous Financial Products division). 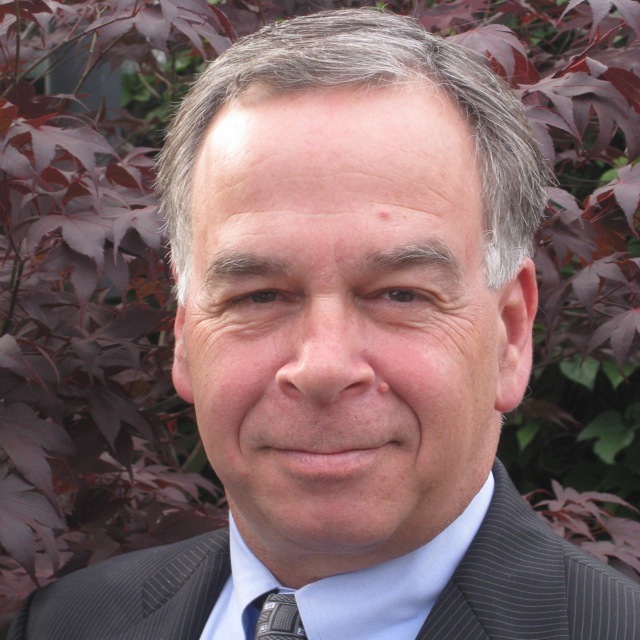 Richard has consulting experience in the US and over 20 countries. Past clients include USAID, the World Bank, the State Department, the Harvard School of International Public Health, the Government of Hungary, as well as corporations and investors. He has experience in financial and data analysis, systems design, operations, and management. The incredible response and mobilizations against the coordinated attacks on workers’ rights and middle-class jobs in Wisconsin, Ohio and Indiana have grabbed most of the media spotlight during the past few weeks. The so-called emergency managers bill would allow Gov. Rick Snyder (R) to declare a “financial emergency” in a city or school district and appoint a manager with broad powers, including the ability to fire local elected officials, break contracts, seize and sell assets, eliminate services—and even eliminate whole cities or school districts without any public input, according to the Michigan Messenger. I’m here to tell the governor that he has to stop this attack on working-class citizens. Removing the people that we put into office without any check or balance is completely undemocratic. empowers this financial czar with the governor’s approval to force a municipality into bankruptcy, a power that will surely be used to extract further concessions from hardworking public-sector workers. Different versions of the bill have passed the state Senate and House and final action is expected early this week. Snyder has proposed ending his state’s Earned Income Tax Credit, cutting a $600 per child tax credit, and reducing credits for seniors, while also cutting funding for school districts by eight to ten percent. At the same time, as the Michigan League for Human Services found, the state’s business taxes would be reduced by nearly $2 billion, or 86 percent. So-called right to work bills have been introduced in more than a dozen states, including Indiana (temporarily off the table), Maine, Michigan and Pennsylvania with Republican legislatures and governors. Paycheck deception bills that would silence workers’ voices in the election process have been or soon will be introduced in nearly two dozen states, including 15 where Republicans control the legislature and hold the governor’s office, including Florida where the bill was approved by a Senate committee this morning. Prevailing wage laws protect communities and workers from unscrupulous contractors low-balling bids on taxpayer-funded construction projects by setting wage rates to the local or prevailing standard. Ohio Gov. John Kasich (R), with the support of construction industry CEOs, vows to eliminate Ohio’s prevailing wage law, and legislation has been or will soon be introduced in 19 states, including nine with dual Republican control. In 22 states—12 with Republican governors and legislatures—moves are under way to eliminate Project Labor Agreements (PLAs) that would hurt communities, workers and small businesses by lowering wages. Public school teachers and employees are fighting back against assaults in more than a dozen states, including some so-called “education reform” proposals that are thinly veiled attacks on teachers’ rights and privatization schemes. Bills attacking immigrant workers’ rights and immigrant children’s education, including many patterned after Arizona’s anti-immigrant law passed last year, have been or will soon be introduced in some 30 states, half of which are Republican controlled. This blog originally appeared in blog.aflcio.org on March 14, 2011. Reprinted with Permission. About the Author: Mike Hall is a former West Virginia newspaper reporter, staff writer for the United Mine Workers Journal and managing editor of the Seafarers Log. He came to the AFL- CIO in 1989 and has written for several federation publications, focusing on legislation and politics, especially grassroots mobilization and workplace safety. When his collar was still blue, he carried union cards from the Oil, Chemical and Atomic Workers, American Flint Glass Workers and Teamsters for jobs in a chemical plant, a mining equipment manufacturing plant and a warehouse. He has also worked as roadie for a small-time country-rock band, sold his blood plasma and played an occasional game of poker to help pay the rent. You may have seen him at one of several hundred Grateful Dead shows. He was the one with longhair and the tie-dye. Still has the shirts, lost the hair. 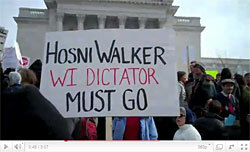 A massive protest against Wisconsin Gov. Scott Walker’s attempt to eliminate collective bargaining rights for state workers entered its second day in Madison with as many as 30,000 people, according to some estimates. More demonstrations are expected tomorrow. Also for more information and to help support Wisconsin workers, visit the Facebook page of Protect Wisconsin Families here. AFL-CIO Field Communications staff member Mike Uehlein sends us the latest report on today’s actions. We also have new video (above) from Tuesday’s demonstrations. In a continuing show of support for public workers, huge crowds arrived in Madison today to protest Gov. Scott Walker’s attack on Wisconsin families. A diverse collection of working men and women, students, community members and religious groups marched around the Capitol building. Despite the practice of hearing testimony from any Wisconsinite who wishes to speak, the Joint Committee on Finance cut off public debate late last night. So today at the demonstration, a public citizen’s forum was offered for people denied the ability to speak at the Joint Committee hearing yesterday. We will not stand by and watch those rights be taken away. For every person here today, there are 100 more who could not make it and we stand with them. This proposal is too extreme. No one should be taking away our rights as workers and our rights as Americans. Politicians are trying to take away workers’ union rights in Wisconsin. We need representatives to listen to the thousands of workers here today and stop this bill. We have to stop this now. This bill is too extreme to push through in four days. We have worked with both Democratic and Republican governors before and we can do that again. This Blog originally appeared in http://blog.aflcio.org/ on February 16, 2011. Reprinted with permission. Were it otherwise, of course, companies and individuals who hire workers would have an incentive always to require workers to sign independent contractor agreements so they might avoid the costs associated with maintaining a workforce made up of employees. Complying with minimum and overtime wage requirements, paying workers’ compensation insurance premiums, and making rest and meal breaks available are significantly more burdensome and expensive than maintaining a workforce made up of independent contractors. Further, because independent contractors generally are not protected by federal or state anti-discrimination laws, maintaining a workforce comprised of independent contractors can shield companies from civil rights lawsuits. •	whether the service rendered is an integral part of the alleged employer’s business. California courts are required to evaluate the specific terms of engagement carefully and analyze the conditions under which a person works for another before reaching a classification determination in a wage and hour or discrimination lawsuit. Further, under California law, one who works for another is presumed to be an employee, unless the employing party proves otherwise. The burden of proving the existence of an independent contractor relationship shifts to the “employer” to demonstrate its classification is proper once a worker presents sufficient evidence that he or she performed work for the company. Robinson v. George. This burden shifting is set out in the California Labor Code at section 2750.50. While determining the proper classification of a worker is extremely fact intensive, and not every factor always points in the same direction, California appellate courts have been consistent in their use of the multi-factor approach set out more than 20 years ago by the California Supreme Court. On August 5, 2010, the federal Ninth Circuit Court of Appeals analyzed California’s employment classification law in a lawsuit brought by “independent contractors” of a freight pick-up and delivery service who claimed they had been misclassified as independent contractors. In Narayan v. EGL, Inc. the Ninth Circuit rejected the defendant’s contention that because its workforce signed independent contractor agreements, the court was compelled as a matter of law to find that its workers were properly classified as such. The court applied the appropriate California classification test to the facts of the case and ruled that the relationship between the drivers and the freight-handling company was one of employment. The independent contractor agreement was only one of several factors the court considered in coming to its Porgy and Bess conclusion: Call it what you may, It Ain’t Necessarily So. Based on its analysis of all of these characteristics of the relationship between the drivers and EGL, the Ninth Circuit determined that the lower court’s dismissal of the worker’s employment-based claims was contrary to California law. Though the drivers had signed independent contractor agreements with EGL, the facts demonstrated the workers were employees from start to finish. While the Ninth Circuit decision in Narayan v. EGL is not earth-shattering or unexpected, the decision is important for California workers whose lawsuits are often transferred (“removed”) from state courts to U.S. District Courts within the Ninth Circuit . The decision re-affirms the Ninth Circuit’s recognition that its District Courts, like California’s Superior Courts, are obliged to use the multi-factor test set out by the California Supreme Court in S.G Borello & Sons v. Department of Industrial Relations many years ago. This is good news for California workers. When I was still in college, finishing up my Undergraduate Degree, I worked in a high-end hotel in Chapel Hill, NC. In the back next to the time clock was the poster that listed your rights and responsibilities as an employee. Among those was the explanation of Right-to-Work. At the time, I didn’t fully understand it and my Supervisor explained to me that it meant that I did not have to join a Union if I didn’t want to. OK, so what does that have to do with anything? As I become more politically aware and did more work in progressive politics, I learned exactly what it meant to live and work in a Right-to-Work state. For starters, it weakened Organized Labor’s political power to fight for better wages, better benefits, and to make sure that Union members were not terminated without cause, or At-Will. While I am a pretty independent minded person and I don’t want anyone telling me that I have to join something as a condition of my employment or as part of my way of earning a living, the part that is not talked about as much is the At-Will employment aspect. The possibility of your job being terminated without cause has always been very unsettling to me. I have always felt that employers have a disproportionate amount of power over employees in this respect. 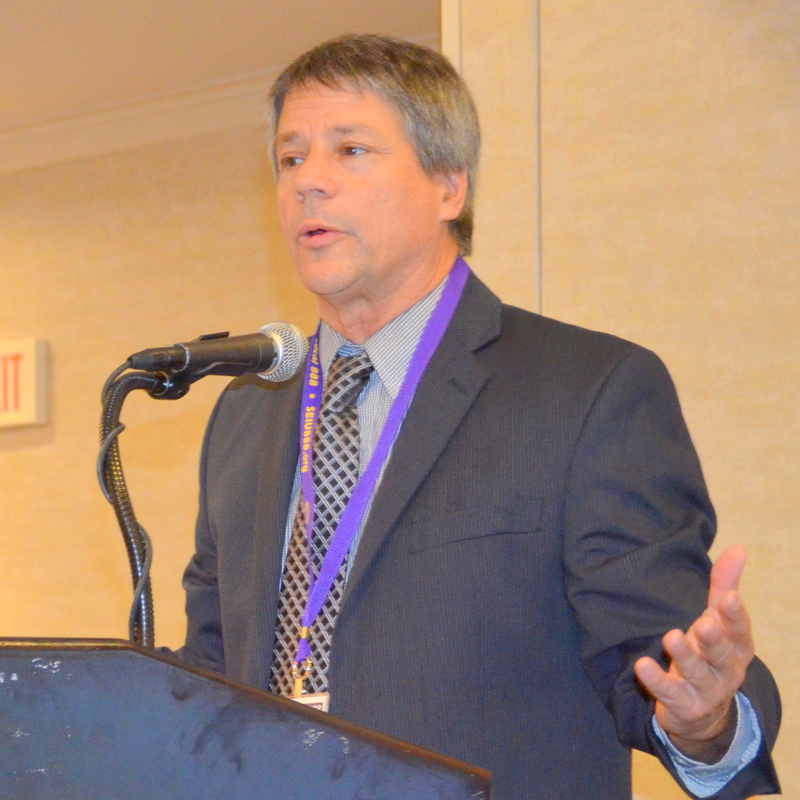 Right-to-Work and At-Will employment are tied together very closely here in Virginia. While I can see some rational with not having to join a Union as a condition of my employment, I am absolutely opposed to the At-Will doctrine for a number of reasons. While the At-Will doctrine can be exercised by either the employee or the employer, the opportunity for workplace abuses on the part of the employer is much greater. While I can certainly appreciate the rights of the employer, being able to hire people that are qualified and will do work that will make your business or company successful, there has to be a limit to being able to terminate someone without cause. I’ve worked with many different types of people over the years, many of whom I just as soon forget for a wide range of reasons, but what if that annoying co-worker has a point about the way things are done at their place of work and complains? Despite being annoying, they do good work, are reliable, and come to work on time, is it right to fire this person for speaking up or expressing their opinion? If sexual discrimination, or any discrimination for that matter, is occurring in the work place and someone speaks up, is it fair that that person be fired. If the employer is changing a posted schedule for employees without giving them enough notice and the employee speaks up or complains, is it right to fire them? There are other scenarios, but these are some of the ones that seem to be the most common. In a post on a blog a few months ago, I was disappointed to read that one of the Democratic Candidates for Lt. Governor was a strong supporter of Virginia’s Right-to-Work law. Again, I can see some rational about not being forced to join a Union as a condition of employment, but the At-Will doctrine that is so closely tied to Right-to-Work law needs to change. My suggestion would be to allow businesses or companies to have the right to terminate without cause within a 60 to 90 day probationary period. After this, if an employee is to be fire it has to be for cause. The At-Will doctrine puts too much of the burden on the terminated employee to show they were fired for improper reasons, and too much power in the hands of the employer. Any other thoughts? 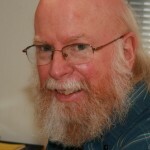 About the Author: Barry Butler has been active in progressive politics and social justice since 1998. He is a native of Virginia from the Southside Hampton Roads area of Chesapeake. He is a graduate of North Carolina Central University with a degree in Political Science and is a part-time Graduate Student at Duke University. Barry is a trained political and community organizer, currently involved in blogging and Strategic Consulting projects. He and his family reside in Campbell County, just south of Lynchburg, VA. This article originally appeared in Off K Street on May 11, 2009. Reprinted with permission of the author. You are currently browsing the archives for the Right to Work & At-Will employment category.